One of the hottest selling Android phones on the market currently, shown off proudly during CES 2012, is the Samsung Epic 4G Touch (aka Galaxy S ll on other providers). We just had to do a real life user test to really see if all the buzz was worth it. Best testing ground-Social Media Week, five day conference running from 9am to 5pm and then a array of after parties. No better place to test multimedia usage and battery power. The phone comes in black or white and has a 4.52” Super AMOLED™ Plus Screen. The phone in total is 5.11″ x 2.74″ x .38″ and weighs 4.6 ounces. It is a bigger screen but it is a super slim, sleek phone nontheless. It is a touchscreen with touch “buttons” on bottom row of phone. The only dislike is where the home touch space is usually located at the far end like similar Samsung phones, the home button is now second in line, which takes some getting used to. Overall it’s a very clean design and great to look at your media content on. Let’s talk battery power first. Coming from another Samsung phone (the Nexus) that was good for about 6 hours of real life use (Twitter, Facebook, Google Maps, camera, texting, & yes, phones calls), I was super excited to go from leaving my house at 7:30am and work all day on one charge. I didn’t need to recharge until about 7/8pm. That means a lot to me, as a professional at is out all day traveling from client to client. The mobile is powered by 3.7 Volt, Lithium Ion, 1800mAh battery. Battery lasts (just sitting) for about 10 Days, full charge talk time (hours) up to 8.7 hours. 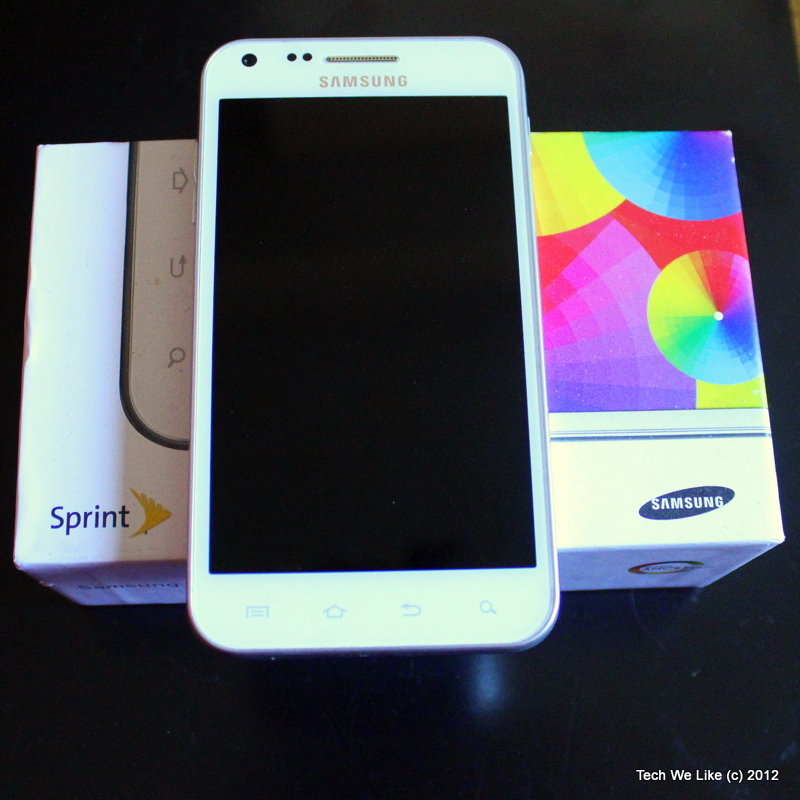 Fast computing; running Android 2.3.4, Gingerbread with a 1.2 GHz, Dual Core (Samsung Exnyos C210) processor. What this means is when on the 4G network, it’s fast. For the business minded user take the speed of use and add Microsoft® Office Compatible, Polaris, vCard/vCalendar, and Smart Search and you’re able to stop huffing around the heavy laptop. Messaging is made easy and a touch away with Email, Corporate Email, Picture Messaging, Text Messaging, Instant Messaging, Threaded/ChatStyle Messages, Video Messaging, Swype™, and Predictive Text (T9®/XT9®) aka Swype. I’m a big multimedia geek especially with taking photos. For not too serious photo taking I’m happy to leave the big professional camera at home and use the phone. With a camera resolution	of 8.0 MP on back (and a great flash) and a front-facing camera resolution of 2.0 MP, does the job of video chatting. When going to shoot, take your fingers and bring together or apart to zoom in or out with the digital optical 4X zoom. Additional camera features are: Auto focus, with shot Modes; Action, Beauty, Cartoon, Panorama, Single, and Smile. You can geo-tag your photos as well before using the online image uploading (Picasa) option. For video there are these different options; camcorder, DivX®, HD recording, HD playback (only via adaptor optional accessory), video Share, and TV-out (only via adaptor optional accessory). The video records H.264, H.263, MP4; or streaming. The only downfall with experience I was getting was that because the design is thin and sleek, keeping a good grip while using might be an issue. I was able to get around this though by using the Casemate, Pop Case which has rubberized gripping on sides. I think this phone is a good runner against the iPhone craze from the Android line. Samsung is kept up pace in the smartphone market by offering a comparable handset. It’s worth the upgrade from what’s been offered. 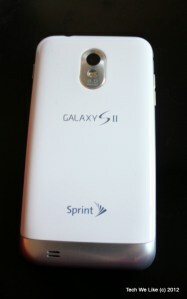 I upgrade to it from the Samsung Google Nexus S and am very happy with it. I like the bigger brighter screen for looking at Netflix. The audio is great for music play back. I can hear people well during phone calls even on speaker mode. All in all good smartphone investment if you’re looking at Sprint’s Android offerings right now.